For many years I have been complaining about the lack of adequate sound systems etc at public hearings. Recently during a Royal Court trial the Commissioner (Judge) complained four or five times within an hour that she could not hear the proceedings and offered the observation that if she could not hear - "how about the people in the public gallery." 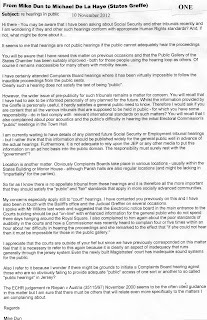 Unfortunately, there is a widespread belief in Jersey that such hearings are just private matters between the parties involved and that the "public" are just there sheltering from the rain or something similar, if they happen to turn up. Of course the "public" presence to observe that "fair and impartial" hearings take place - justice seen and heard to be done and all that jazz - is a most essential and important part of the process. All sorts of mischief takes place behind closed doors and we all know what can be hidden when the States goes into "in camera" session, as it all too often does. Not just in the main assembly either - but in all those Scrutiny meetings etc under "closed to the public" rules that are ever more common these days. So it's not just about poor sound systems for the public. 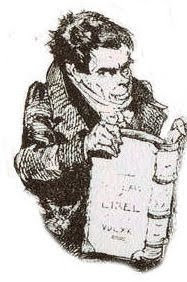 If the Judge cannot hear and the parties are missing important words then the whole notion of "hearings" is made farcical but the ability of the media to report fully and accurately on these public matters is also made much more difficult - thus "free expression" and "exchange of information" is also in danger. 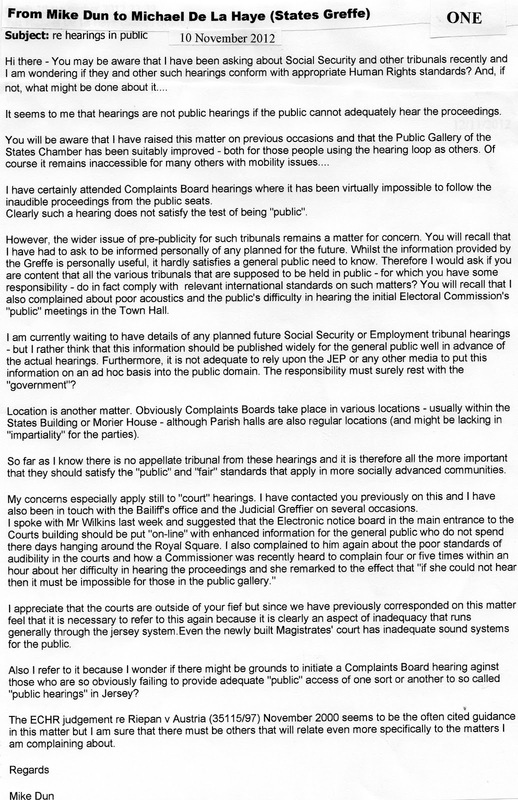 But there is much more to the notion of "hearings in public" because in Jersey it is often virtually impossible to know where and when "public hearings" are to take place. Thus until I complained, there was no public notification of "inquests". Now they are listed on the electronic notice board inside the lobby of the main entrance to the Royal courts building. This is totally inadequate of course - as is the other information on this board regarding court hearings but it is a START. I have asked for this information to be enhanced and put on-line as a further improvment but that will still be an inadequate service of public notification. Hearings that cannot be heard and public tribunals that take place without prior public notification are the stuff of repressive regimes the world over. In Jersey I suppose it is just the result of incompetence on a good day but the suspicion that our government and administration deliberately seeks to hide these things from public gaze and attention must be considered. Of course, there are international standards and test cases have been heard at the European Court of Human Rights on the conduct of "public hearings" but we all know that the Jersey government does not treat such human rights standards with much seriousness. 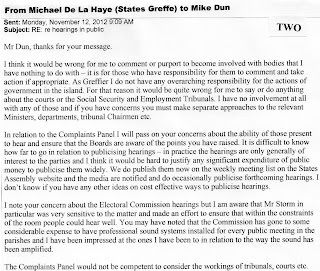 The range of "public hearings" that take place in Jersey with usually defective standards is extensive. Even the hearings in the newly built Magistrates' Court are difficult to hear from the "public seats" behind the glass barrier. The Victorian barn that is the main Royal court is a total disgrace as is the converted "Old Library" where most of the speaking is aimed towards a distant judge and away from the plebs. 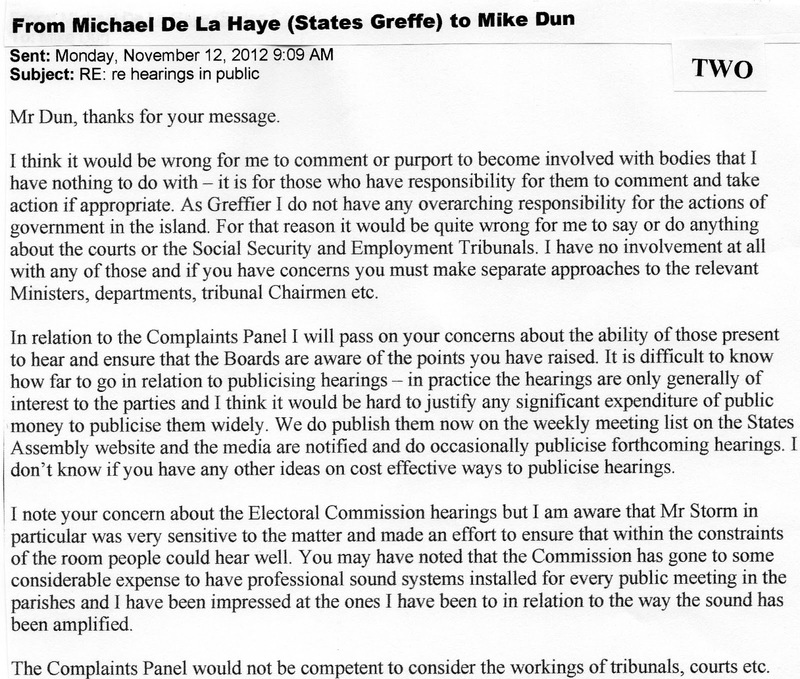 But who knows what cases are actually scheduled to take place unless the JEP happens to mention it beforehand? And, when did you ever hear beforehand about a Social Security appeal or an Employment Tribunal and would you have any idea when and where these take place or whether you can attend? 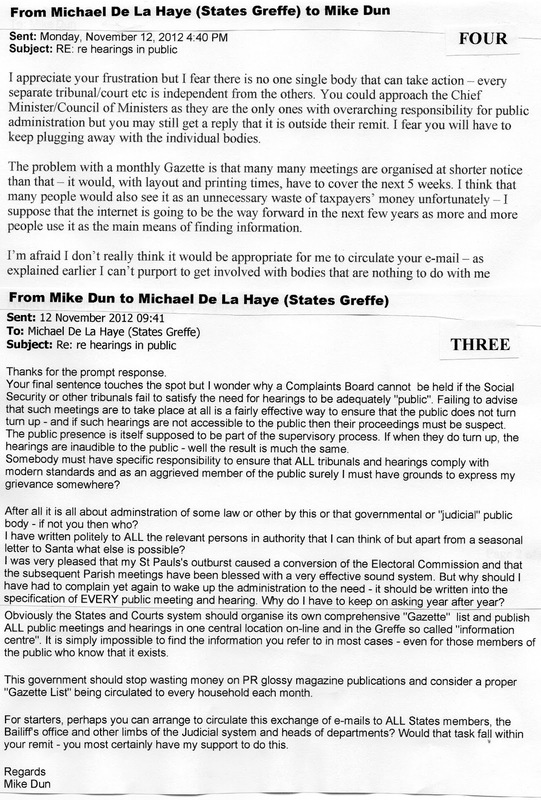 The current Electoral Commission hearings are an ongoing case in point. Until I complained that the sound systems were inadequate and that the hearings were poorly advertised nobody seems to have considered the requirements to make these fully "public". Now of course the Parish hearings have excellent sound systems - so it can be done - but there should be a minimum, standard specification applied as routine for ALL such events. As things stand, the JEP receives over £300,000 per annum so we are told in public advertising including the "Gazette" official notices section. This clearly is an incomplete service since it does not advertise most public "hearings" that are due to take place. Senator Ozouf really should curtail this waste of public money and bring this information service back within the governments domain and control. ALL public hearings and meetings should - at least - be advertsied on an official Gazette on-line site on the States gov.je facility. The current gov.je information is incomplete, haphazard and often difficult to find (even for those that are aware if it exists). The former Greffe bookshop - now laughingly called the "States Information Centre" needs to be a centralised source of printed information of all public hearings and Parish Halls too could provide similar facilities. It is not good enough to shrug shoulders and say that only a few people ever turn up to occupy the public seats at hearings. Public participation is impossible without prior notification and frustrated by lack of proper facilities. 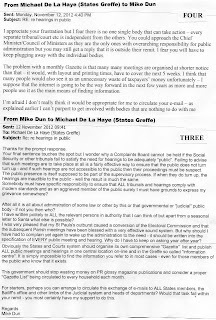 The e-mails copied above are recent exchanges with States Greffier Michael De La Mare. As he writes, the responsibility to improve standards for ALL public hearings and tribunanls rests with nobody in particular. I have today copied the exchange of e-mails to ALL States Members. So far I have received one acknowledgement and two "out of office" responses. Oh - I forgot to mention the joke that is the States "Communications Unit" that only gives information to a select "accredited" few and refuses to invite the general public/bloggers to "press briefings". Now of course the "public" will be shelling out another £60,000 or so to pay for the latest PR spin machine - but shall the "paying public" be invited to participate in the process....? Not on your nellie... would this money be better spent in providing a proper government Gazette site giving details of ALL meetings, hearings, tribunals and briefings etc etc...the answer is YES. The JEP try CONNING THE PUBLIC again!